It was the first sunny day in Vietnam so far. Honestly, it was, however we’ve deleted the photos from the day. Can’t find them, gone lost forever. Good job we wrote some notes for this blog. We decided to hire bikes and ride to the beach to enjoy the sun. 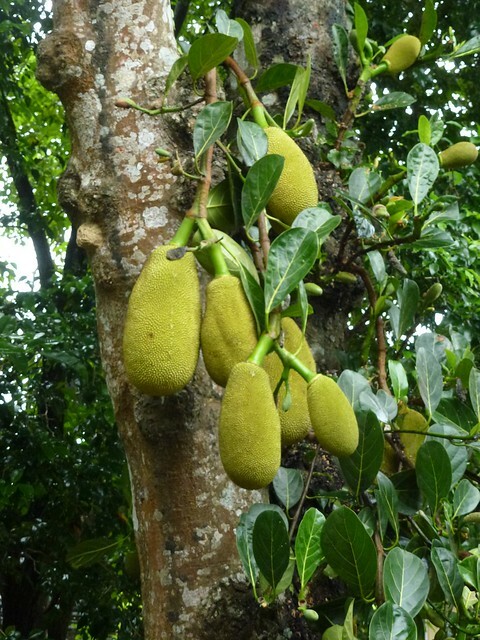 It cost 20000 dong for the day, so around 60p each. We rode the short 5km to the beach which wasn’t too strenuous and then proceeded to sunbathe all day. The beach was ok for enjoying the sun however the waves far too big to swim in. For lunch we had boiled chicken, garlic with rice. And a soup. Very similar to a dish we eat at home a lot. 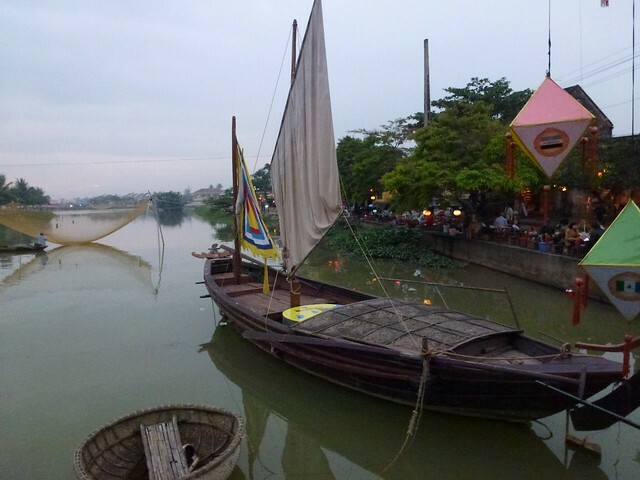 Up really early in the morning to travel to Hoi An. 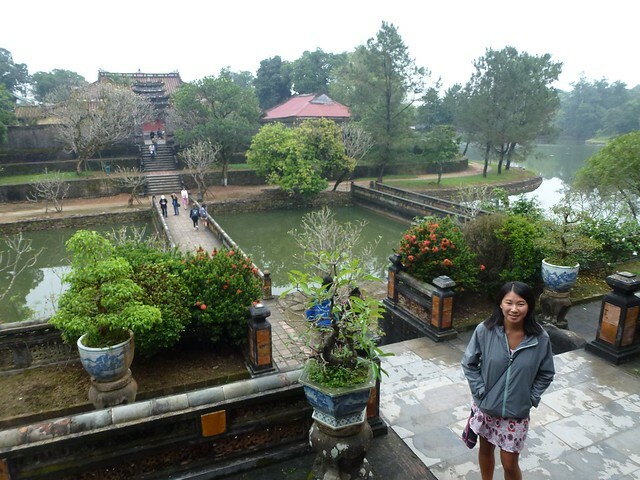 It wasn’t too to Hoi An from Hue with us arriving around 12:30, we had a little walk to find our hotel. We stayed a hotel just out of the old historic area, Khách Sạn Nhị Trưng. 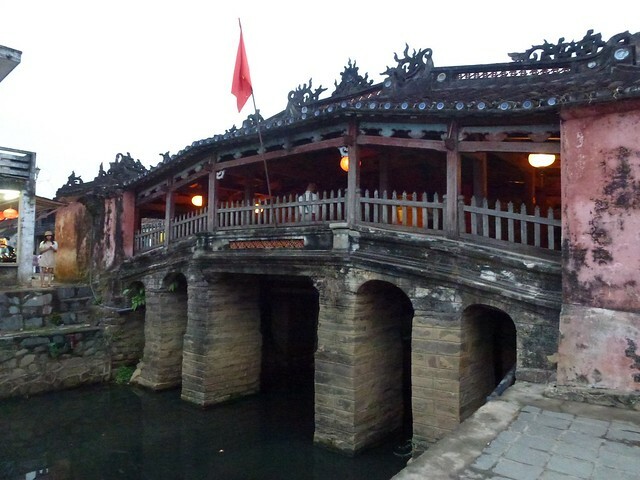 Hoi An is a UNESCO World Heritage site which is known for its old town. 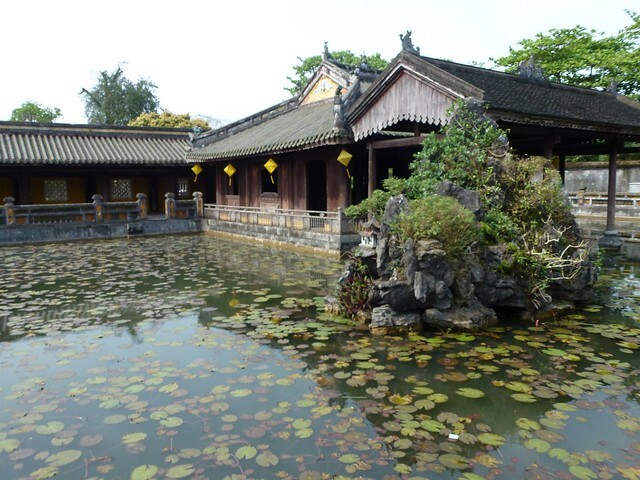 With original buildings it’s a fantastic place to wind down a little from the hectic bigger cities in Vietnam. After checking in and exploring a little we headed for some food. 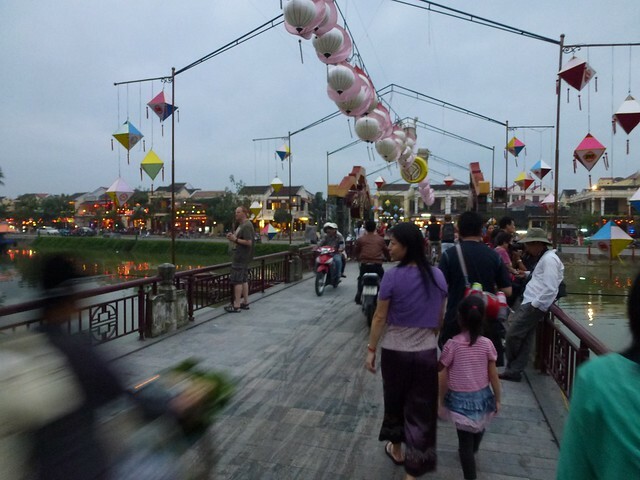 Hoi An is know for a couple of local dishes. First up Cao lau. 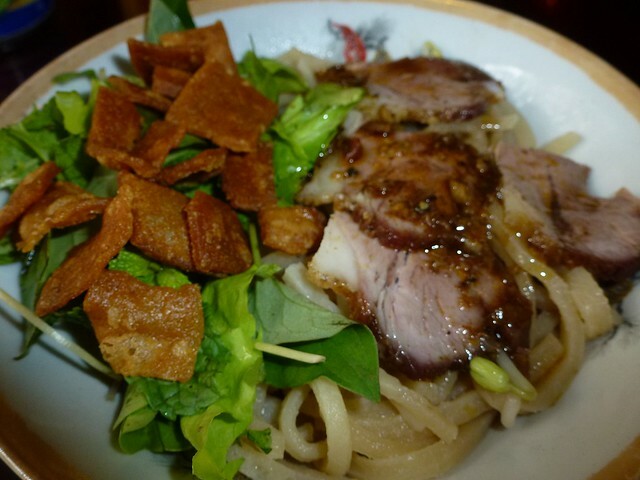 With fat yellow noodles, pork, veg and crispy croutons which I think were crackling. John ordered Cao lau while I had Pho. 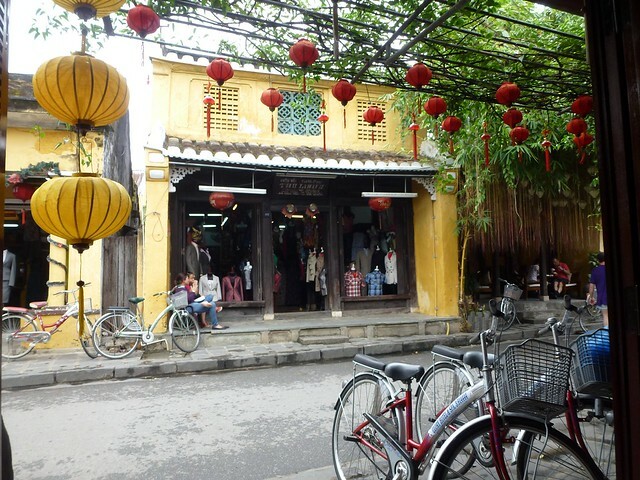 Hoi An also know for its tailors, shop after shop offer custom-made dresses, suits, coats. The shops have the latest catalogues from next, Top Shop, Marks and Spencer, you go in pick what you want and a couple of days later you’ll have the piece of clothing at a cut down price. After buying a dress in Hue I decided to again spend a little with the view to sending some of the items home in the post. After a bit of haggling I managed to buy a dress and a jacket for around £30. After a little walk around in the afternoon and a nap it was time to head back out for some more food. Around by the river at night the lights were amazing, it was really chilled and a great place to eat in the evening. We picked a little tent that was setup on the other side of the Japanese bridge. 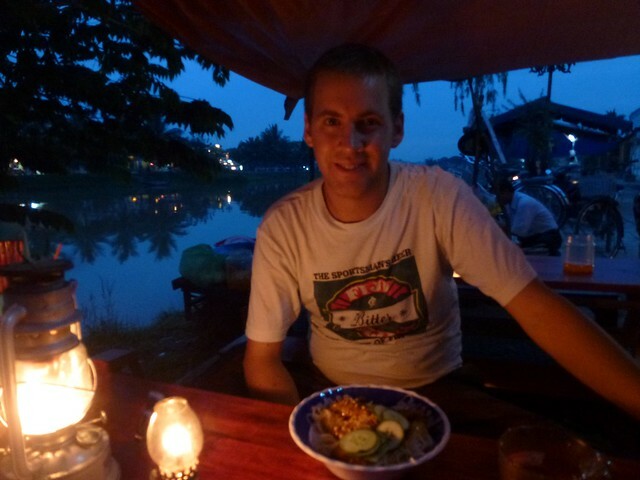 It was time to try another local dish – white rose Hoi An. 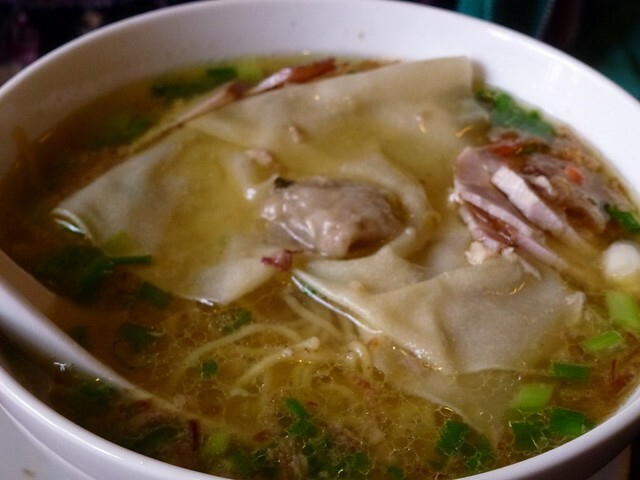 A type of dumpling noodle with prawns and pork mince with crispy bits on top. It was nice! 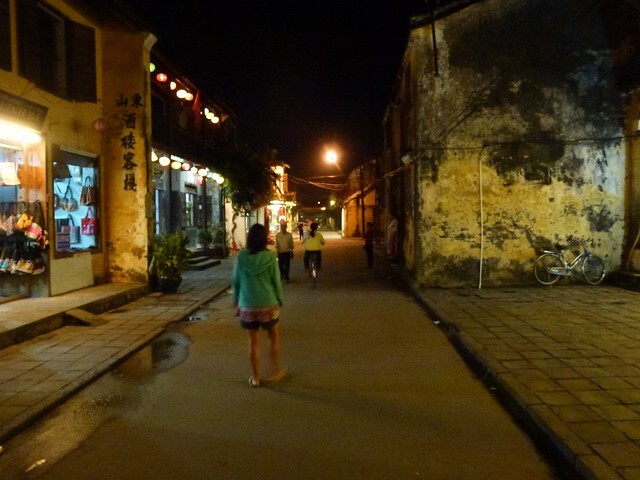 After eating far too much we wandered around the streets a little more before heading back for some well-earned sleep. 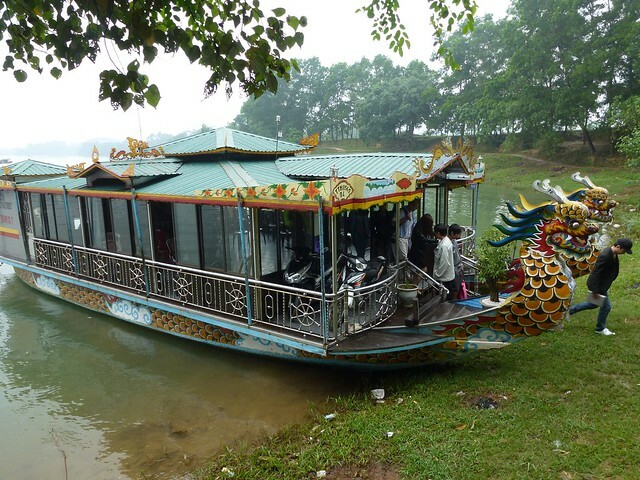 Another touristy day in Hue, this time on a dragon boat tour on the perfume river. It was pretty cheap and a good way to see a number of sites in the local area in one day. The boat was slightly strange, almost a like a conservatory on a pontoon. 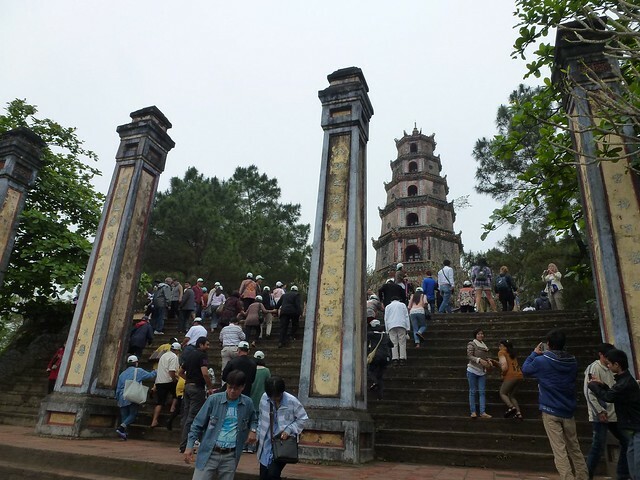 Our second stop after a temple was Thien Mu Pagoda, a famous seven-tier pagoda. 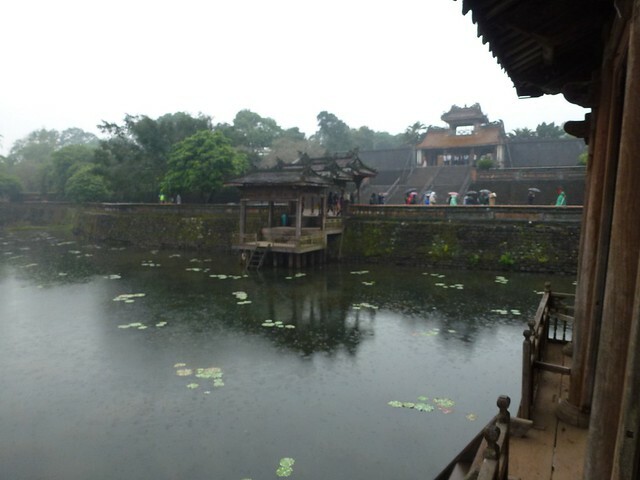 After lunch on the boat we then headed off on a bus to visit 3 more temples. 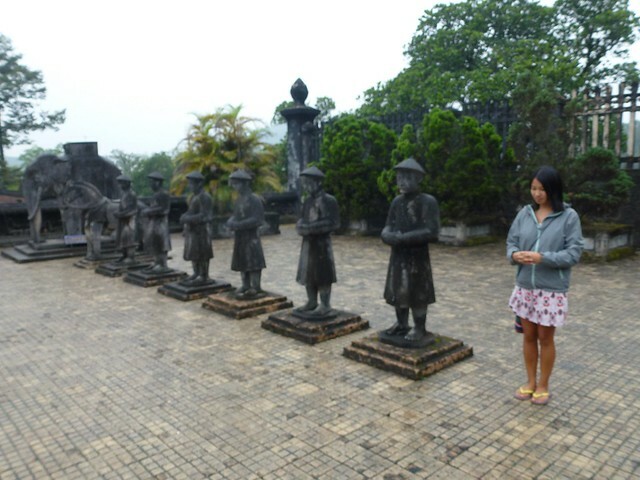 Can you spot the one not made out of stone? Overall an easy day trip, nothing too strenuous. In the evening we headed to pick up the custom-made dress ordered the day before. It was perfect. 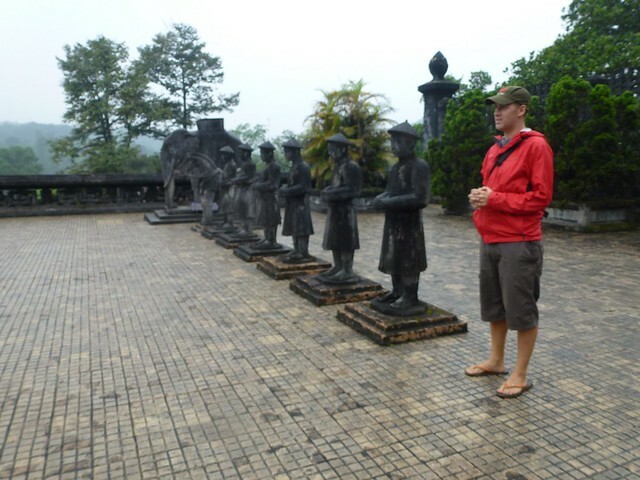 John also needed to head out to book the bus for the next day to get to our next destination Hoi An. We had already paid for the tickets with the bus ticket from Hanoi to HCMC. All we had to do was take the ticket to the office to book seats. We couldn’t find the tickets in the hostel. After a long look under the bed with head touches we found the ticket, John headed off to make the booking. He made the booking but the entire time still had his head touch on his head above his cap. Idiot. 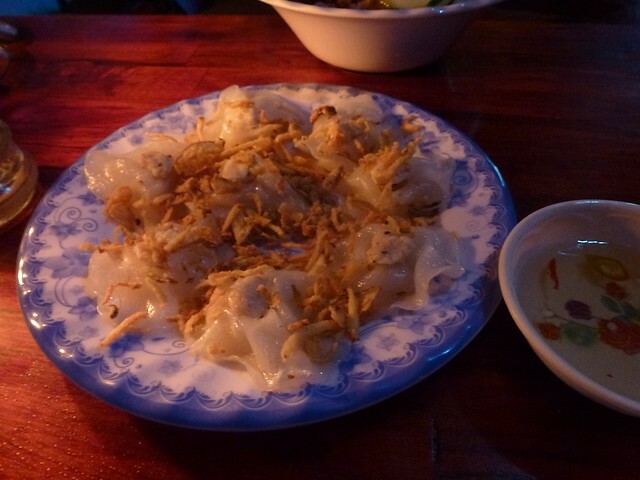 After that we headed for some food trying a Hue pancake, or has the locals call it Banh Khoa. 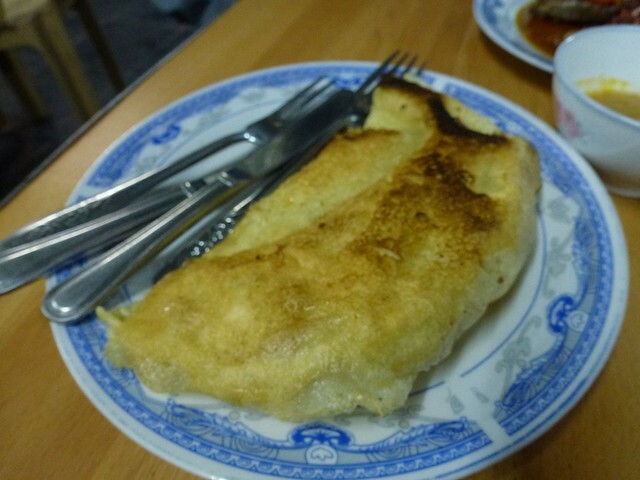 A pancake filled with prawns, bean sprouts and other veg. 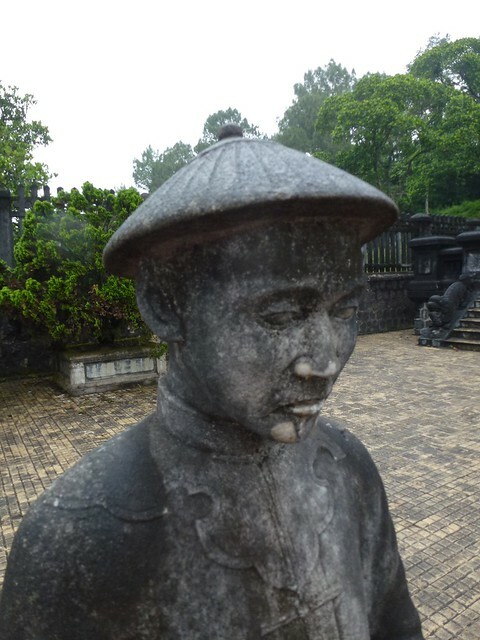 Located halfway down Vietnam is the imperial city of Huế, one of the old capitals of Vietnam. 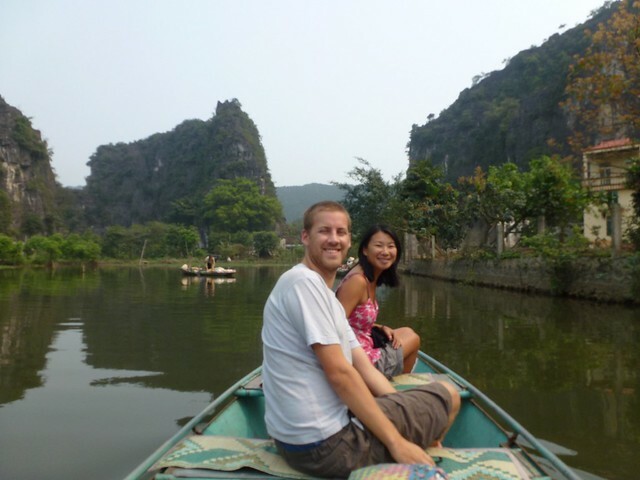 We arrived on the stinky overnight bus from Ninh Binh at 10:30 and checked into the Hue Backpackers hostel. To get there we jumped on motorbike taxis from the bus station. 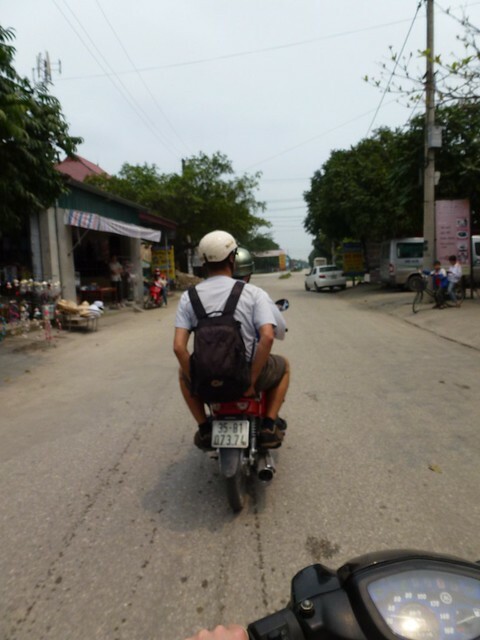 The first time we had used the motorbike taxi in Vietnam – know as Xe Om’s. We were in a dorm at the Hue Backpackers hotel on the top floor, but for the first time in a double bunkbed. So 4 people in total in one bed, we were on the top bunk. With not having the best nights sleep we headed into the citadel to have a look old city. Located over the river the old square-shaped city was in relatively good condition considering how old it was. Our camera was dying that day so we didn’t get many photos of the main entrance, city walls and the massive national flag. 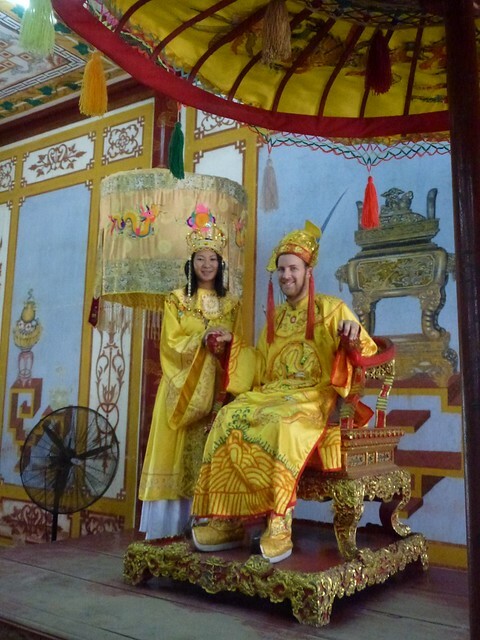 Once inside we saw that you could pay $5 to dress up in ceremonial costume and have photos on a throne. 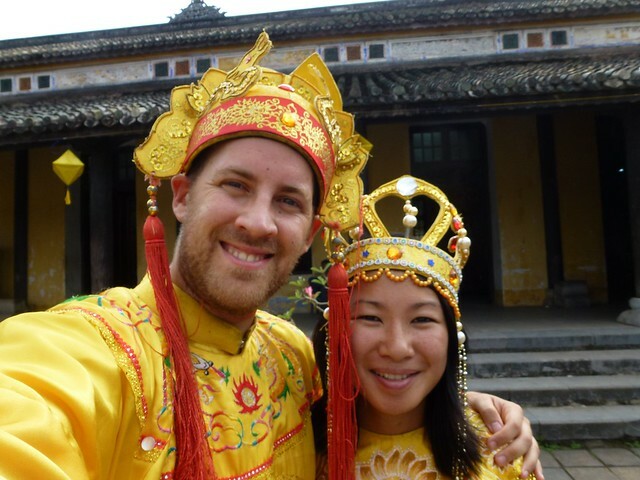 We thought it would be funny to dress up and sent the photos home to our families saying we had a traditional Vietnamese wedding. We decided in the end not to send the photos just in case anyone didn’t get the joke! 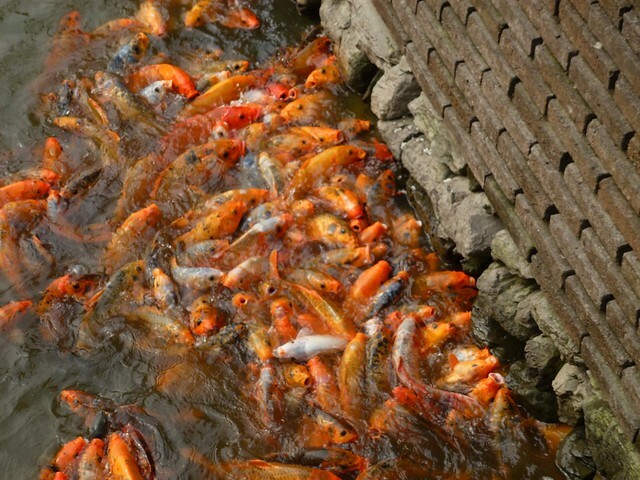 One of the most interesting things to watch was the huge koi carp in two ponds going metal as people fed them. They wiggled over each other clambering to get some food and you could hear their mouths opening and shutting. 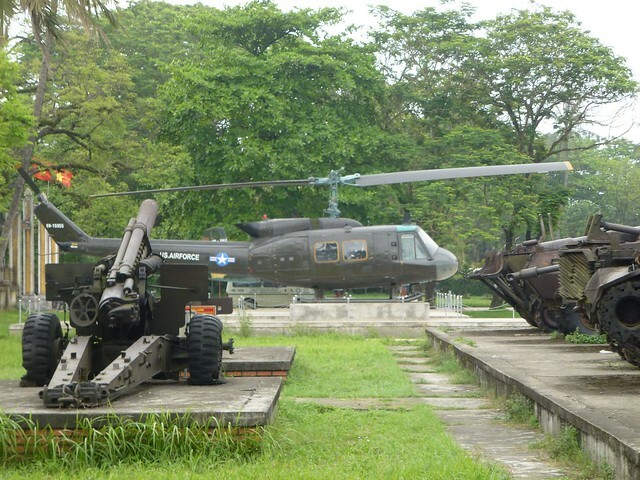 After a quick meal of noodles we visited some of the old relics from the Vietnam war, Hue had been the centre of a large battle in 1968. The old citadel we visits still had bullet holes in some walls and destroyed buildings. With us not having much sleep over night on the bus we headed back to the hostel to have an afternoon nap. In the evening we headed off some food and then shopping for a custom-made dress. Time for another day tour! We were up early and started the day with a noodle soup breakfast before we hopped onto a motorbike for a tour to Tam Coc. The hotel staff were our drivers for the day taking us from place to place. 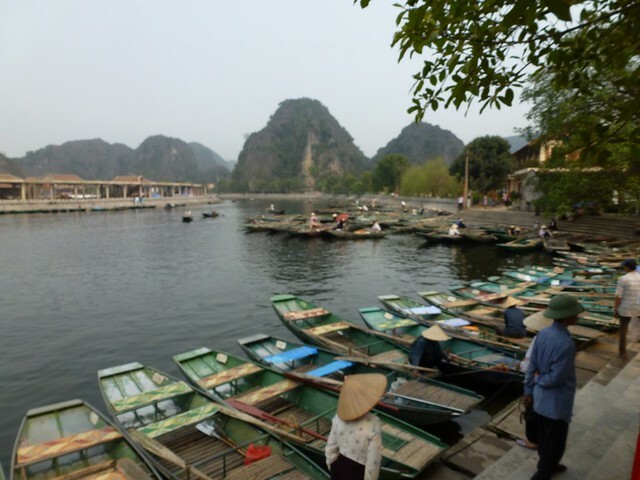 Tam Coc is a network of rivers which meander around rice fields and limestone mountains. 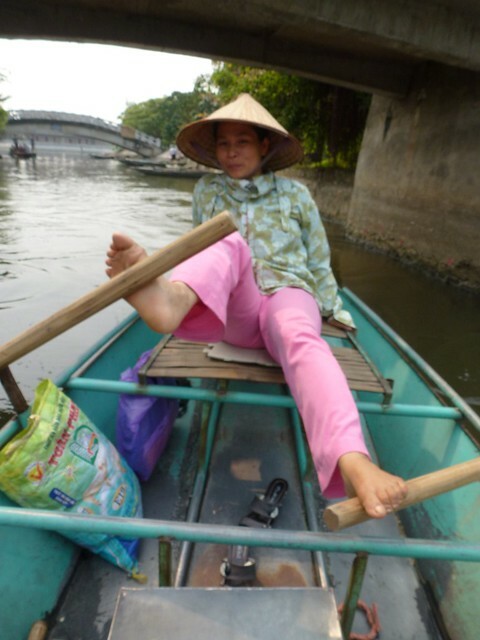 You can hire one of the little boats to take you on a tour – the highlight being the ladies that row the boat…. who use their feet! There were loads of school children who were also on the tour that day from the local school. 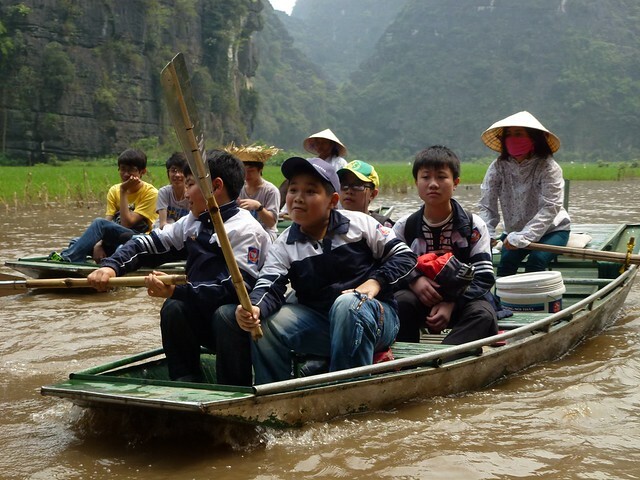 There were more local children than tourists, and each boat couldn’t wait to test their English on us. The lady rowing our boat was great, taking pictures of us, helping us get a drink and navigating through the hundreds of school kids. Overall it was very relaxing to get away from the hustle and bustle of the streets. 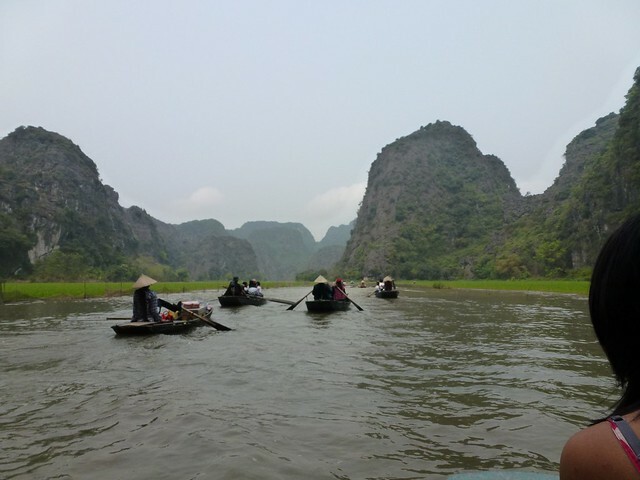 It was like Halong Bay but with rice paddies and a little less tourist-centric. After the boat tour we had a quick lunch meal of goat. Again, no chance to eat any dog. 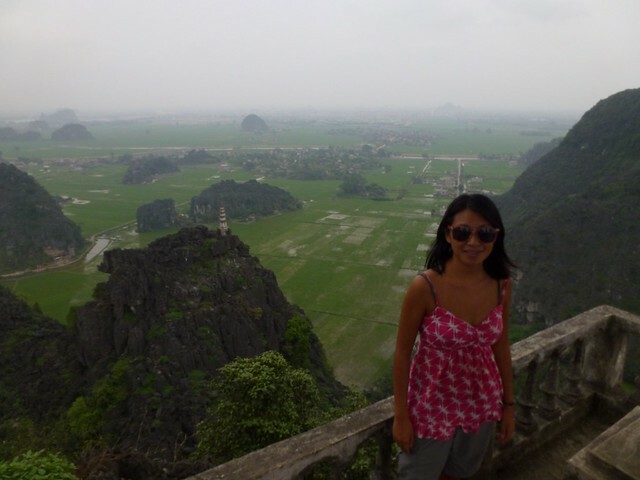 Then we were back on the motorbikes to climb up one of the huge limestone mountains for a good view of the area. 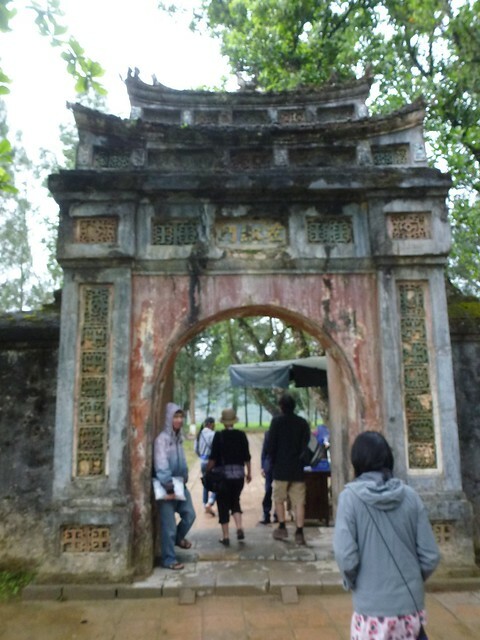 After the climb, we headed to Hoa Lu, the old ancient capital. There was a festival on so we didn’t have to pay to get in but it was really really busy. 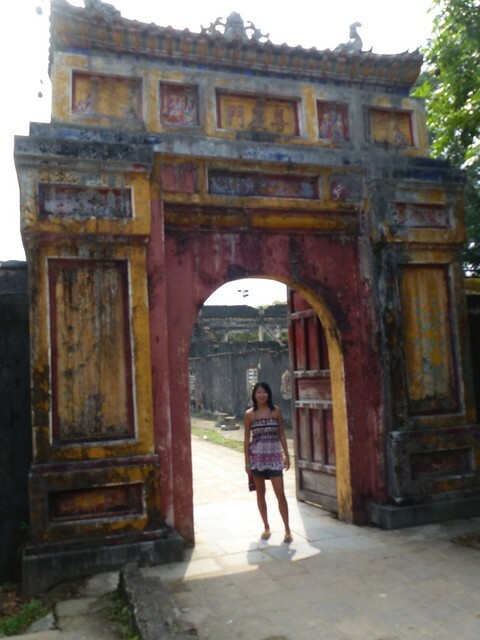 We walked around some temples and drank sugar cane drink, at which point the camera died. 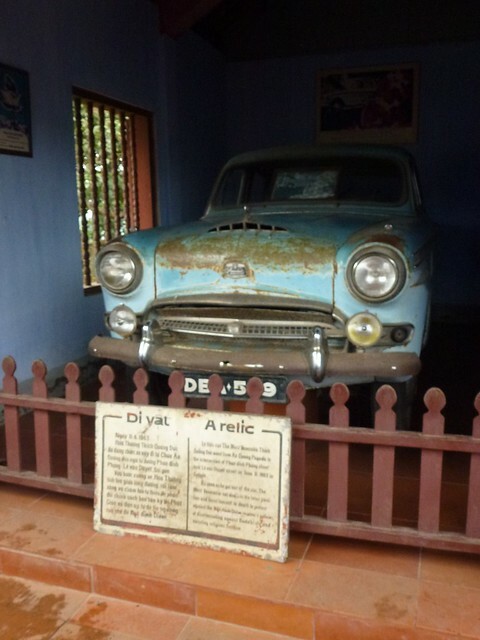 We returned to the hotel in the evening for a meal and then onto our first sleeper bus to Hue. We picked up a ticket that would allow us to ride all the way from Hanoi to HCMC in the south. We could separate the journey up with day buses and night buses. The first nightbus had three columns of beds with two levels, the only beds left when the bus arrived from Hanoi were ones at the back, next to the stinky toilet and engine. It was a long ride.